Titusville is located on the western shore of the Indian River Lagoon, the country's most biologically diverse estuary. This page primarily addresses wildlife observation related to the Lagoon, the Merritt Island National Wildlife Refuge, and Canaveral National Seahore. All of which is habitat related to the Lagoon itself and the Atlantic Coast. Wildlife obvservation oportunities here are extremely diverse, ranging from estuarine and oceanic birdlife to alligators and marine animals such as Manatees, Dolphins, Sea Turtles, and even an occasional sighting of a Northern Right Whale. Photo; Otter at Merritt Island National Wildlife Refuge by Dean Richard Pettit. is less that 10 minutes from Titusville and consists of 140,000 acres, over half of which are brackish estuaries and marsh habitat.The remaining lands consist of coastal dunes, scrub oaks, pine forests and flatwoods, and palm and oak hammocks. A total of 1,045 plant species has been identified on the refuge. More than 500 species of wildlife have also been documented including 330 species of birds, 117 fishes, 65 amphibians and reptiles, and 31 mammals. Of these, 16 are currently federally listed as threatened or endangered. These species include the Florida scrub jay, The west indian manatee, the southern bald eagle, the american alligator, and six different species of marine turtles. 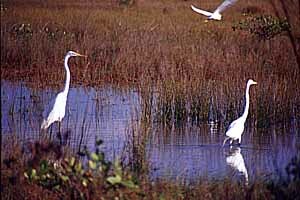 Black Point Wildlife Drive / Cruickshank Trail , two of the more popular sites out on the refuge, were featured in the May 2000 edition of "Outdoor Photographer" magazine under the section entitled "Favorite Places". Black Point is a one way drive that features many species of wading and shore birds and well as ducks, an occasional Northern Harrier (marsh hawk), Bald Eagle, as well as many other species. About halfway through the wildlife drive there is a parking area with an elevated viewing platform forming the trailhead for the Cruickshank Trail, a walking trail that follows the impoundment dike around the wetlands for about 4 1/2 miles. To get there, take the Max Brewer Causeway (State Road 406) east from Titusville on to the refuge. About 1.4 miles after you enter the refuge entrance you will soon see the sign leading you to Black Point on the left. Check out Harriet Treider's Out There! eMagazine Black Point Photo essay Here. The Hammock Trails are found about a mile east of the visitor's center on the left, where parking is provided and two loop trails take you through the hammocks and wetlands. The Oak Hammock trail is about 1/2 mile in length while the Palm Hammock Trail runs about three miles. Both of these trails can be pretty wet following periods of rain and be sure to bring plenty of bug repellent from about March through October. Songbirds, Peleated woodpeckers, and raptors can be spotted along these trails along with some wading birds. Other possible sightings include bobcats, raccoons, and other woodland wildlife. The Scrub Ridge Trail is the newest of the trails at Merritt Island Wildlife Refuge, and featuresthe favored habitat of the Florida Scrub Jay, an endemnic species to the state, existing nowhere else. It is a one way path of several miles that goes through a habitat of low lying scrub oak and palmetto bushes. In addition to the Scrub Jay, many migratory birds use the low scrub for food and habitat while the skies are often patrolled by Raptors. 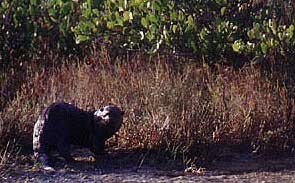 Indigo snakes, gopher tortises, armadillos, and bobcats are other possible sightings. You can read my Out There! eMagazine Scrub Ridge Trail experience Here. The Manatee Viewing Platform at Haulover Canal offers a chance to see Florida's most famous marine mammal, the West Indian Manatee, while the shoreline and trees along the water offer chances to see a variety of wading birds, waterfowl and osprey. Dolphins also frequent the canal. To get there, drive from Titusville on the Max Brewer Causeway (SR 406) east across the Indian River Lagoon, until you come to the Black Point turnoff. Take the Black Point turnoff and continue on this route ( you are still on SR406) past the entrance to Black Point Wildlife Drive until the road ends at State Road 3. Turn left here and head north until you cross the bridge at Haulover Canal. Turn to the right immediately after crossing the bridge and follow the dirt road to the parking area for the deck. To get to the refuge headquarters and visitor's center, stay on the main road as it veers to the right (at which point it becomes State Road 402). You will soon see the entrance on the right about 2.3 miles past the Black point turnoff. Heres a map of the refuge! This map is PDF format. You can download and print it if you have Acrobat Reader. More Merritt Island Wildlife Refuge info! Photo of Egrets by Dean Richard Pettit. Cape Canaveral National Seashore adjoins the Merritt Island Wildlife Refuge, is just 15 minutes from Titusville and covers 57,000 acres. It is the longest stretch (24 miles) of undeveloped beach on Florida's east coast. You can get there from Titusville by heading east on State road 406 across the Max Brewer Causeway onto the Merritt Island Wildlife Refuge, veer to the right at the Black Point Turnoff and you are now on SR402. Follow the road past the refuge headquarters and visitor's center until you come to a stoplight. This is the intersection between State Roads 402 and 3. Stay on 402 (straight) and you are now on Canaveral National Seashore. The scrublands along the entrance road between the State Road 3 intersection and the pay station ($5 entrance fee) are excellent habitat for Florida Scrub Jays, Florida's only endemnic bird species which are frequently seen along the roadside (please drive carefully, we like these guys). They look somewhat similar to a common blue jay without the crest and have a brown patch on their back. After the pay station, the impoundments along the road leading to the beach are excellent places to see many species of wading birds. During the migration periods huge flocks of white pelicans feeding in unison, and huge gatherings of great and snowy egrets make for a spectacular bird watching experience. This section of the road also offers a chance to get as close to the space shuttle launch pads as you can get without taking a Kennedy Space Center bus tour. After the road passes the impoundments it turns to the north and runs parallel to the beach for about five miles, providing a good view of native coastal strand habitat with sea grapes, sea oats, saw palmettos and other associated vegetation. Morning glories bloom in season. 13 parking areas are spread along this beach, each with a bathroom and a boardwalk to provide access to the beach without degrading the strand habitat. Other than this the beach is totally undeveloped and these dunes provide their own unique opportunities for bird and wildlife viewing including perching birds, racoons, and even the occasional bobcat. At parking area number 8 is the Eddy Creek area where you can launch a boat, kayak, or canoe and explore the northern end of the Mosquito Lagoon for exellent wildlife observation or fishing, for redfish or seatrout. Along the beach itself you can see numerous shorebirds such as willets, plovers, sandpipers, seabirds such as pelicans, gulls, and terns, and when conditions are right, pelagics such as boobies, shearwaters, storm petrels and gannets. Merlins and perigren falcons are also sighted in winter. Each summer, six different species of Sea Turtles come up on the beach at night to lay their eggs, and while the Seashore normally closes at night, guided sea turtle tours are available. call (321) 267-1110 for more information. In the late Winter and early Spring, Northern Right Whales winter and calve in the waters offshore from about the Florida Georgia border to East Central Florida. Occasionally they come close enough to be sighted from land. Manta rays occasionally are seen leaping clear of the water while dolphins cavort just beyond the breakers. So when at Canaveral Seashore for birding, keep your eyes on the water out to the horizon as well, you never know what you may see. More Canaveral National Seashore info! Photo of Glossy Ibis by Dean Richard Pettit. Spaceview Park / Veteran's Park is located on the Downtown Riverfront. Below the seawall surrounding the canal to the north at this location is a thriving white mangrove shoreline that supports fish nursury activity which in turn draws quite a bit of bird activity. In fact, 49 species have been documented by the Titusville Environmental Commission to use the area including various heron and egret species, shorebirds, lesser scaup, osprey, cormorants, gulls, and anhingas among others. Also a great viewing area for Space launches. Across the Indian River Lagoon, the Space Shuttle launch pads are visible to the left of the Vehicle Assembly Building with Pad A being closer and B farther to the left. Unmanned Launches (Titan, Delta, and Atlas) leave from pads just to the south. Sandpoint Park Sandpoint Park is located at the intersection of US 1 north and Garden Street near the Downtown Historic Disrtrict northeast of the intersection. It is a riverfront park and has a retention pond on the site. Looking out over the river you can see gulls, pelicans, ducks, osprey and many other species. The retention pond attracts wading birds, cormorants, and anhiga. The Northeast section of the park is a peninsula that shelters the City Marina. Along the marina and river shoreline is one of the better opportunities to spot west indian manatees and dolphins. In fact, if someone appeoached me and said they wanted to see a manatee, this is one of the first places I would send them. Check the shallows along the along the seawall on the riverside of this peninsula, the channel leading to the marina basin, and the basin itself. Rotary Riverfront Park is located at 4141 South Washington Avenue (US-1) next to the Mcdonalds and provides a dock and observation deck from which you can scan the Indian River Lagoon for pelicans, cormorants, ducks, gulls, terns, osprey, and other lagoon wildlife. Another great viewing area for Space launches. Across the Indian River Lagoon, the Space Shuttle launch pads are visible to the left of the Vehicle Assembly Building with Pad A being to the right and pad B to the left. Unmanned Launches (Titan, Delta, and Atlas) leave from pads just to the south. Scobie Park can be found at the eastern end of Main Street where it runs into Indian River Blvd. on the riverfront in the old Downtown District. It is currently a city maintained vacant lot with a stormwater berm on the property. However, the shoreline and shallow waters adjacent to the property attract many species of wading and shorebirds. In fact, the Titusville Environmental Commission has documented 55 species of birds at the site, including the reddish egret pictured at left. In early spring, flocks of about 30 to 50 black scimmers have been sighted resting in the area with various gull species interspersed within the flock. last fall a roseate spoonbill and several woodstorks were frequent visitors. Other sightings include black-necked stilts, ruddy turnstones, sanderlings, wilson's plovers, greater and snowy egrets, great blue, little blue, and tri-colored herons among others. The stormwater swale is kept nicely mowed and is a great place to sit and observe the birdlife. The Space Shuttle launch pads are visible across the Indian River, making this a great place for "birdwatching" of another kind as well. Photo of Reddish Egret by Dean Richard Pettit. Max Brewer Causeway / Parrish Park Parrish Park is located on the Max Brewer Causeway just past the bridge on the left. From the seawall here you can see pelicans, ducks, osprey, gulls, cormorants, dolphins, and manatees. A little farther to the east you can pull off the road and add wading birds and lots of shorebirds, as well as alligators to the list. During the cooler months, a flock of hundreds of black skimmers interpersed with gulls and terns like to hang out on shore here and will let you approach quite closely in your car for excellent close up photo opportunities. They will leave if you exit the car. Scottsmoor Landing Access point to the Indian River Lagoon at 2400 Huntington Avenue. Look for migratory ducks in season, view shorebirds and wading birds along the shoreline. Northern harriers hunt among the black needle rush marsh, where rails hang out in the tall weeds. Also look for painted buntings along the entrance road. from Mims, go 5 miles north of SR-46 then turn right on Huntington Avenue across the railroad tracks to the park at the end of the road.